One of the fantastic things I love about Paris are these "autolibs". 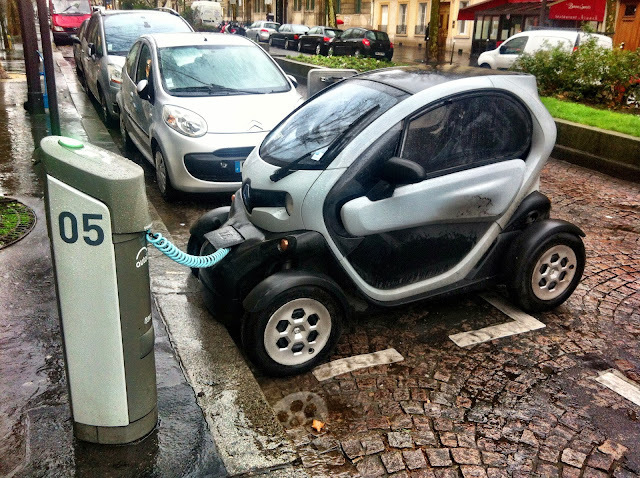 Electric cars that are hooked up to a power source and available for everyone to share. Makes sense right? In a huge city like Paris you don't really need your own car. You might need a car for half an hour or so to get somewhere, perhaps when it's raining, or maybe for an afternoon to go to Ikea, or maybe a little longer to move apartments etc. For everything else, there are buses, trains, the metro, vélibs or, your own two feet. So the theory was, what if everyone was able to share a set number of cars stationed in enough locations in and around Paris? They could pick a car up at one station near their departure point, then drop it off at another station near their destination and, only pay for the time they used the car. Cheaper than hailing a cab or hiring a car, with the added flexibility of not needing to actually drop it back anywhere specific (now wouldn't it be cool to have an autolib' station at the airport...?! although I'm pretty sure the taxi cab industry would take to the streets and start protesting if that went ahead). Okay, so even better yet, what if these cars were electric? 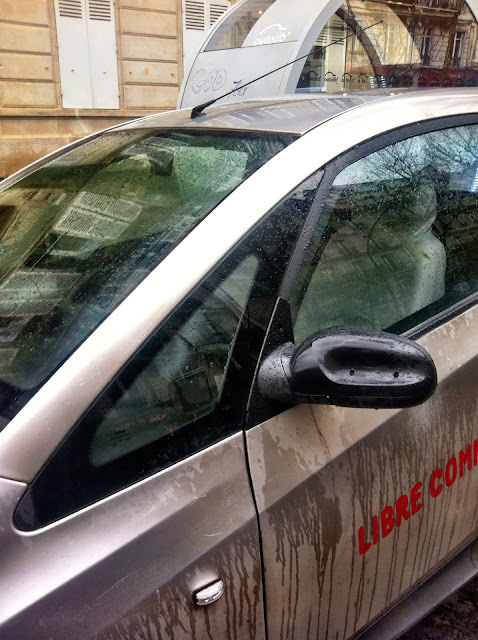 In addition to increasing the overall efficiency of the usage of these cars, Paris could potentially reduce carbon emissions, reduce noise pollution, reduce air pollution, reduce traffic circulation, and even reduce car-park-searching-stress-induced-road-rage...! And so, Autolib' was rolled out in December 2011 to complement the already successful Vélib bike sharing initiative from 2007. 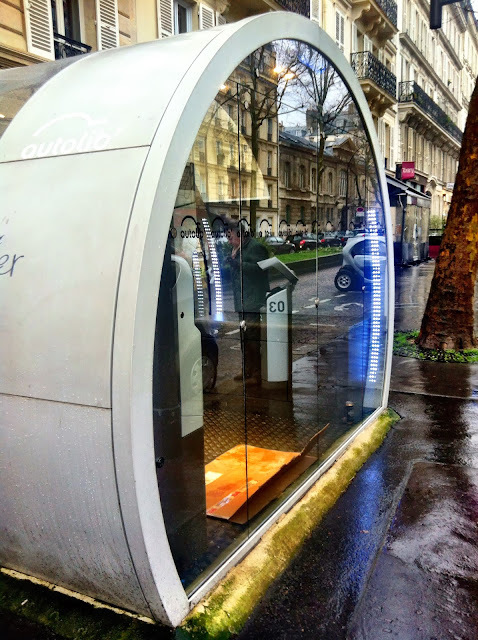 Come 2014, Autolib' now has almost 1000 stations in and around Paris and a fleet of around 3000 electric cars. My friend explained to me just how easy it was for him to zoom around Paris today. From only 3.67€ for 20 minutes, he was able to pre-book his autolib' from a pick up point (valid for 30 minutes) from his Autolib' app. He was also able to pre-book his car park near his destination (valid for 90 minutes - note that this is a HUGE INCENTIVE as I have spent hours, literally hours, I kid you not, in the car looking for a park with John, getting annoyed at why my Parking Angel cannot function in Paris as well as she used to function in Adelaide), all from the convenience of the same Autolib' app. 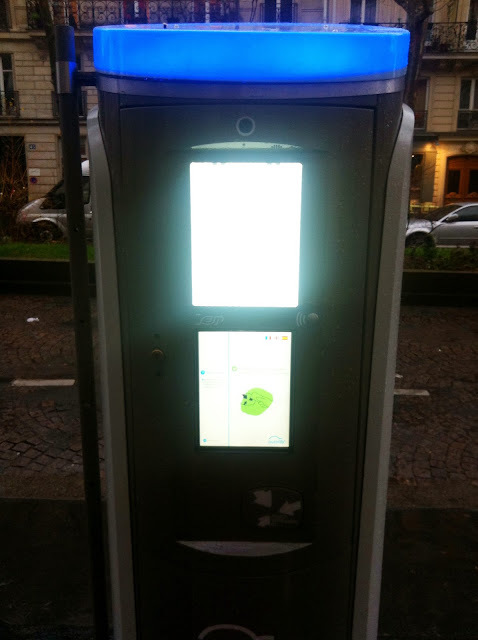 You head to an autolib subscription kiosk and sort out your registration in one of these cool booths (you can also sort out your subscription online or at their head office at 5 rue Edouard VII 75009). All you need is to be over 18, have a valid drivers licence (International/European), a valid ID (passport/national identity card) and a credit/debit card. 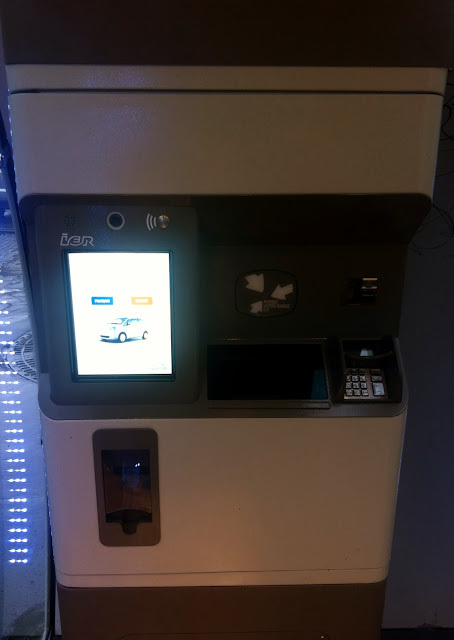 You'll be able to scan your ID and drivers licence, pay for the membership (sliding scale cost in relation to how long you want to subscribe for) and speak to a customer car representative via the webcam to finish off the paperwork. 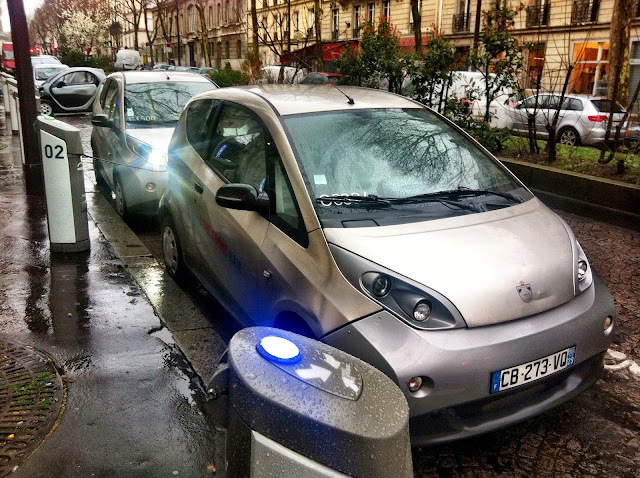 You will then be issued with an autolib card on the spot after everything. Note that there are often special promotions available. An extra 2 months for free on an annual subscription is currently available on the website. My friend signed up for half price! So it is definitely worth having a snoop around first before signing up to get the best deal. Once all of that is sorted, you can head to one of these rental kiosks, situated next to the booth to hire your autolib' (depending on which one is available). 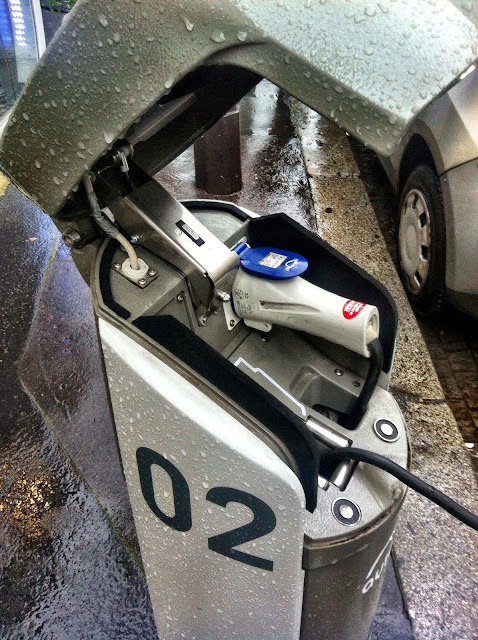 After that, you just tap your card over the sensor of the recharging pod hooked up to your electric car. It'll allow you to release the charging cable and recoil it back in and close the lid. Head around to the driver's side and tap your card on the credit card sized reader which is located in the corner of the driver's triangular side window to open the door. Hop in and off you go! It will welcome you by name, allow you to load up your GPS co-ordinates and even remember your favourite radio station! It's a speedy little electric car, getting up to 60kmph in only 6.3 seconds. When you are done, park your car at your pre-booked car park, without having to agonise over finding a park, then double checking if it's a REAL car park or just a trap to get fined as soon as you turn your back. It's super easy, you just tap your card onto the recharging pod to open it up, plug in the cable to recharge your car and Bob's your uncle! You only pay for the time between the first tap that releases the cable and the second tap that plugs back in the cable. You can also choose not to book ahead and just drop it off at any station with a free space (you know those spaces you get excited about when you are looking for a park before realising it's an autolib' space..!!). Click here to find your closest station. For those with kids in tow, apparently you can even purchase an inflatable kiddie seat to use in these autolibs. My friend bought his to inflate and deflate each time he took his little daughter for a spin in an autolib'. Starting at 3.67€ per 20 minutes, if you're a family of 5, it might be an even more cost effective option than taking the metro..
PS Another cool feature: being able to charge your (own) electric car at a rate of 1€/hr! Electric bikes and motorbikes have even cheaper rates! It really makes my heart sing seeing fantastic initiatives like these help reduce our collective carbon footprint, one step at a time. For more information, check out the Autolib' FAQ page!